Catch all the updates from the seventh day of competition at the Gold Coast Commonwealth Games. India's Medals Tally currently reads 12 gold, 4 silver, 8 bronze. Shreyasi Singh defeated Australia's Emma Cox in a shootoff for gold in women's double trap, while Ankur Mittal settled for bronze in the men's event. Earlier on Day 7, Om Prakash won bronze in men's 50m Pistol event final. Meanwhile, Mary Kom entered the women's 46-48kg Final and the quartet of Saina, Sindhu, Srikkanth and Prannoy registered easy wins in their respective Round-of-32 singles matches. India's Medals Tally currently reads 12 gold, 4 silver, 8 bronze. Manika Batra wins 4-1 against Australia's Tracy Feng to book herself a place in the women's singles quarterfinals. However, Madhurika Patkar lost to England's Kelly Sibley 2-4 to exit the competition. Breathless morning session in wrestling ends. India in with a chance to win 3 GOLD & 1 BRONZE. Medal matches begin 12:30 pm IST today. Arpinder Singh's best of 16.39 and Rakesh Babu's 15.98 in the qualifying round takes the Indian duo through to the final of Men's Triple Jump event. Both finished among the 12 best performers across two groups of participating athletes. And that's it for the day from Gold Coast Commonwealth Games. India have won one gold and two bronze on Wednesday and have taken their total medals tally to 24. India have collected 12 gold and are third in the tally. See you early Thursday morning. Thank You. And the results are out. Botswana's Amantle Montsho has won the gold, Jamaican Anastasia Le-Roy takes silver while another Jamaican Stephanie McPherson takes the bronze. Indian Himas Das never looked in contention but finished sixth with a personal best timing of 51.32. India's second mixed team in badminton have made short of Fiji in the Round of 32. And in some time, the women's 400m final is about to begin. India's Hima Das will compete in Lane 1. Let's go to badminton now. India's second mixed doubles team comprising N Sikki Reddy and Pranaav Chopra are up against the Fiji pair of Burty Molia and Karyn Gibson in the Round of 32. The Indians have won the first game 21-8. In high jump final, India's Tejaswin Shankar bowed out of the final failing to cross 2.27m. His Best attempt was 2.24m and is now out of medal contention. In squash, Indians Vikram Malhotra, Dipika Pallikal Karthik and Joshna Chinappa have won their respective Round of 32 singles ties. The disappointment remained Sourav Ghosal who lost a close encounter against Jamaica's Chris Binnie 2-3. Then youngster Harinder Pal Sandhu too went down against Malaysia' Ivan Yuen 0-3. And India seem to have made a comeback. Goal!!!!! Goal!!!!! India have taken the lead here in the dying seconds. India 4-3 England. a strong flick from the centre got a deflection from the attacker's stick. India hold on now Please!!!. And India have done it. They will play New Zealand in the semis. With less than two minutes to go, India have got another PC. Goal !!! !India have scored and levelled this game with England. India 3-3 England. Can India win this from here??? Fingers crossed. This is going to the wire. India have conceded a PC in the 55th minute. And England have scored and have taken the lead. England 3-2 India. Sam Ward has sent a powerful dragflick to the left corner to see England ahead. India will have to do something miraculous to change the complexion of this game. Oh wait!! Rupinder has pulled his muscle and looks in trouble. Looks like hamstring. India have now conceded a penalty corner on the counter. The first attempt was saved but England retained the penalty corner. And they have scored to go level. Its 2-2 in the 52nd minute. Match on. India's mixed double team of Ashwini Ponappa and Satwik Rankireddy have won to advance to Round of 16 against England. Its a goal. India have taken the lead in the fourth quarter through a penalty corner. Rupinder Pal Singh has added to the goal tally. India 2-1 England with 8 minuted to go. Tejaswin Shankar now crosses 2.24m and is now in lead at the moment. The fellow competitors will also buck up. As we talk Canadian competitor Michael Mason too has leaped 2.24m to join Tejaswin at the top. India's mixed team of Ashwini Ponappa and Satwik Rankireddy have won the first game convincingly against England and are leading 13-8 in the second. If they continue in that vein, they will advance to the Round of 16. India Tejaswin Shankar clears 2.21m in his second attempt to stay in medal contention at Men's high jump final. Fingers crossed. The 3rd quarter has started and after two failed attempts, India has got a penalty corner. Harman injects the drag flick and the ball hits the English defender's stick and the chance is saved. One minute later, India gets a penalty corner again in a goalmouth melee. A review is taken by England and they retain it. No PC for India. 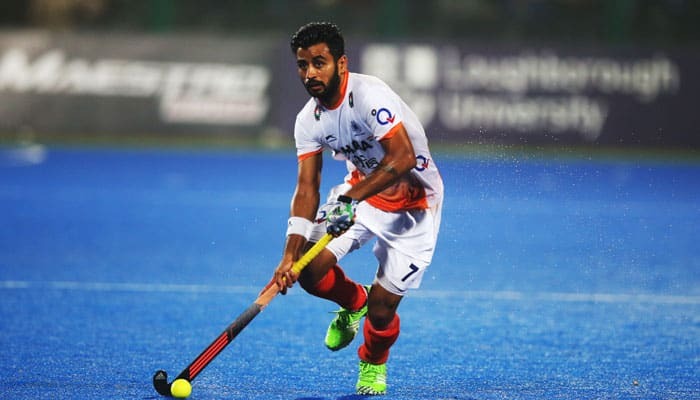 A minute later, India get another chance at the circle and Manpreet Singh drills it past the goalie to bring India level. That's a goal. India 1-1 England. Match on. Following Sharath Kamal, Harmeet Desai has blanked PNG's Geoffrey Loi 4-0 to advance to the round of 16. A while later from now, India's Sathiyan Gnanasekaran will take on Pakistan's Muhammad Rameez in the round of 32 singles tie. Quick update from Table Tennis. India's Achanta Sharath Kamal has won his singles tie against Malaysian Javen Choong 4-3 to advance to the Round of 16. After having clinched the first three games in a domineering fashion, complacency stepped in and he lost the next three games on the trot. But he kept his cool in the decider and won it convincingly 11-7 to stay alive. India fail to convert a chance in the dying minutes of the 2nd quarter. Gurjant reverse hits a ball to Akashdeep in the circle but he fails to collect it and the chance is wasted. England still 1-0 ahead. If India lose or draw here, they will have to face defending champions Australia. India's Manish Kaushik is up against England's Calum French in the quarterfinal of the 60kg category. And this looks tight. The English has given him a tough fight. But the Indian is awarded the win and is assured of a bronze as he gets a unanimous decision in his favour. England have India under the pump now. Another carried by Indians in their D. That's penalty corner for England. But PR Sreejesh dives in time to thwart the drag flick. Good save and Indians will breathe a sigh of relief. Back to the Hockey field. England have drawn first blood in the 13th minute. Massive defensive blunder by the Indians in their citadel. England David Condon reverse flicks a volley direct into the goal. India will have to fight now. England 1-India 0. Nayana James (6.34m) and Neena Varakil (6.24m) have qualified for the women's long jump final finishing among the 12 best performers. Athletics: Neena registers a mark of 6.17m in her first attempt of the women's long jump qualification. The qualifying mark is 6.60m. Table Tennis: Mouma Das also books a place in women's singles pre-quarterfinals defeating her opponent from Mauritius in straight games. Meanwhile, in athletics Nina Varakil is competing in the women's long jump qualifying round. Badminton: Ruthvika Gadde continues the quick-win trend for Indian shuttlers with a 21-5, 21-7 win over Ghana's Grace Atipaka in her Round-of-32 match. Boxing: Pinki Rani joins Sarita Devi as India's losing boxing quarter-finalsts of the day as she was defeated by England's Lisa Whiteside in the 51kg bout with a split 2-3 decision. Shuttlers having a walk in the park in Singles! PV Sindhu defeats Fiji's Andra Whiteside 21-6, 21-3 to walk into the women's singles Round of 16. Meanwhile, Pinki Ranki in action in her women's 51kg quarterfinal against England's Lisa Whiteside. Squash: Gold medal hopes and defending CWG champions Joshna Chinappa & Dipika Pallikal win their third match in a row to finish on top of Pool C of women's doubles event. They defeated the pair from Malta 11-5, 11-6. Kidambi Sirkkanth wins 21-13, 21-10 against Mauritius's Aatish Lubah to reach men's singles pre-quarters. Next up on the court is PV Sindhu, who missed the Mixed Team event due an ankle injury. She will play Fiji's Andra Whiteside. Saina Nehwal dismisses South Africa's Elsie de Villiers 21-3, 21-1 to storm into the pre-quarterfinals at the Gold Coast Games. Next up is Kidambi Srikanth opening India's men's singles campaign against Mauritius's Aatish Lubah. Medal laden Day for #TeamIndia 's Shooting contingent! Manika Batra and Sathiyan defeated Malaysia's Chee Leong and Ying Ho 11-7, 11-8, 13-11. Sanil Shankar & Madhurika Patkar defeated their Sri Lankan opponents 11-5, 11-8, 11-5. Men's Double Trap Final - Bronze for India! Ankur Mittal (53 points) settles for the third position in the Men's Double Trap event. Mohd Ashab (43 points) finished fourth. Here's India's Medals Tally after Ankur's medal. Md Ashab eliminated, finishes fourth. Ankur Mittal in second position currently, assured of a medal. Ankur Mital joint first at the moment, Md Ashab fourth. Ankur Mittal and Mohd Ashab in action. India's Medals Tally currently reads 12 Gold, 4 Silver, 7 Bronze. 12th GOLD MEDAL FOR INDIA! Women's Double Trap: Shreyasi Singh (96+2) defeats Australia's Emma Cox (96+1) in a shootoff to give India its 12th gold at CWG 2018. Varsha Varman (86) a little unlucky to finish on the fourth position, behind the bronze-medallist Linda Pearson of Scotland (87). The experienced boxer ensured there wasn't an upset in store for India as he defeated Zambia's Benny Muziyo with a unanimous verdict (5-0) from the judges to reach the semifinals of Men's 75kg division. India's top medal prospect in boxing, Vikas Krishan is in action in the Men's 75kg Quarterfinals against Zambia's Benny Muziyo. Looks like anybody's fight as the first round ends. Here's the latest from Women's Double Trap Finals. You would not want to miss this highlight package on the action so far from the track, where India's Muhammad Anas almost created history yesterday before finishing 4th in the Men's 400m Final. How about this for a pick! Incredible! The one and only, the fastest man on earth, the legend Usain Bolt has arrived in Gold coast. Good news from the shooting range! India's Mohd Ashab and Ankur Mittal have qualified for the Men's Double Trap Finals. It will be held later at 11:15 am IST. MIXED RESULTS IN MIXED DOUBLES! TT Round of 32: 1. Harmeet Desai and Pooja Sahasrabudhe have lost to their Malaysian opponents 6-11, 6-11, 11-3, 9-11 2 but the experienced team of Achanta Sharath Kamal and Mouma Das went past the Sri Lankan pair 11-6, 4-11, 11-9, 11-5 to advance to the next stage. Gaurav Solanki beats PNG's Charles Keama 5-0 in a unanimous verdict to reach the men's 52kg semifinals, which assures India of another boxing medal. Yesterday, five Indian men boxers also progressed to the semifinals. India's Harmeet Desai and Sanil Shetty have made it to the Round of 16 in Men's Doubles competition with a victory over Guyana's Shemar Britton and Christopher Franklin 11-6, 11-5, 11-7. Defending champions Joshna Chinappa and Dipika Pallikal beat the Welsh team of Tesni Evans and Deon Saffery to win their second women's doubles Pool C match 11-8, 7-11, 11-8.